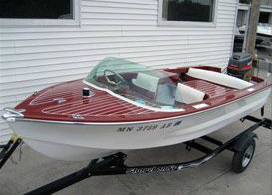 You may see a wide variety of fiberglass boats on Minnesota waters on any given day. They are very popular and can be quite striking in appearance. Owning a fiberglass boat is a luxury that many people would love to have. A boat can lose value quickly if not taken care of properly. Even boat owners with the best intentions can find themselves in need of Expert Fiberglass Boat Repair Services. Take your boat to Anchor Marine Repair to fix anything from a minor cosmetic blunder to major accident repair or a total fiberglass boat refurbishing. Our technicians are passionate about boats and it shows in the quality of work on Boat Repair in Minnetonka. The caring staff at Anchor Marine Repair takes pride in the quality of workmanship provided to our customers. With nearly a half century of experienced in Minnetonka MN Marine Repairs, we have seen it all. Collision Damage, Storm Damage, Gel-Coat Damage, Rodent Damage and Scrapes and Scuffs can be handled efficiently. We are an Insurance Approved boat repair shop with an excellent reputation for service, quality and value. Anchor Marine Repair has a state-of-the-art facility that can accommodate boats up to 38’ in length. You can count on personalized service with the highest standards. Pick up and delivery service within a 250 mile radius is a convenience option provided for our valued customers. Check out some of the Expert Boat Repair Service provided at Anchor Marine Repair. You love your boat and we totally get where you are coming from at Anchor Marine Repair. Besides the thrill of completely refurbishing a beautiful fiberglass boat, our technicians love to spend free time out on the water. 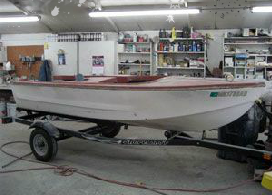 The passion is evident in the top quality workmanship of our Expert Boat Repair Services. Whether your boat has been involved in a major collision, hit by a hail storm or simply showing signs of age, we are the go-to Boat Repair Shop for Minnetonka boat owners.